The Rs 12,000 crores Nirav Modi and Mehul Choksi scam had shaken the nation with its sheer audacity and brazenness. While the Congress blamed the Narendra Modi led BJP Government, skeletons soon started tumbling out that pointed the fingers squarely at the Congress government. We had reported earlier how P Chidambaram, the then Finance Minister had sanctioned the 20:80 Gold scheme on 16th May 2014, the day Congress was voted out of power, to benefit 13 companies including Mehul Choksi’s firm. Now, information has emerged that the India Bullion and Jewellers Association (IBJA) had written a letter to the then Reserve Bank of India Governor, Raghuram Rajan, warning him of the perils of the 20:80 scheme and accusing the Congress government of “deliberately yielding to the cronies” by changing the gold policy days before demitting office. The 20:80 scheme allowed 13 ‘star trading houses (STH)’ and ‘premier trading houses (PTH)’, including Choksi-led Gitanjali Gems to import gold and sell about 80 percent of their total bullion shipment in local markets. This scheme ended up encouraging gold hoarding and aided these traders to artificially inflate the retail prices. The letter by the IBJA to Raghuram Rajan, that has been put out by moneycontrol.com, starts by stating that the 20:80 gold import scheme as introduced the RBI per it’s circular no. 25 dated 14-8-2013 effectively checked India’s precarious CAD deficit. The letter went on to talk about how the 2013 circular by RBI linked the quantity of import of gold for domestic sale with the export performance of the importing nominated agency. Only a handful of specified banks/agencies were authorised to import gold with a clear mandate that the nominated agency shall make available gold for domestic consumption only to entities engaged in the jewellery business/bullion dealers for domestic use. Star and Premier trading houses in private sector, though assigned the status of nominated agencies, were barred from importing gold as they were private traders and their past performance showed that they had always encouraged private consumption and had never cared to cater to the jewellery exporters. The IBJA said that the above stipulations of the 2013 circular bound the Nominated Agencies in the said circular to ensure the end use of gold bars sold in the domestic market, that is, they should be used in Jewellery manufacturing only and not otherwise. The letter said that these restrictions had affected few big bullion traders, as they were not being able to hoard and curtailed cash transaction, and because of that, they were lobbying through electronic and print media, spreading canards about the 2013 scheme. The letter alleged that many of the ‘adverse effects’ were manufactured by them. 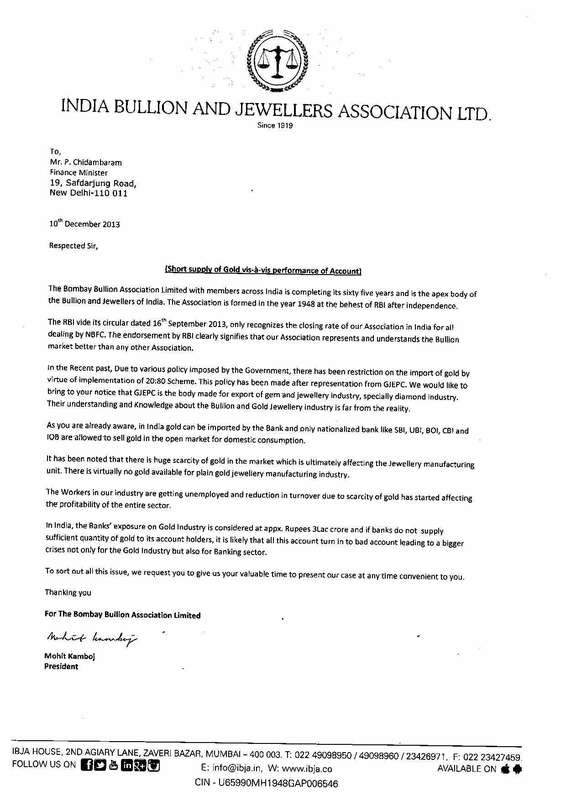 After this precursor and explanation of the 2013 scheme that helped the industry, they went on to elucidate how the UPA, in its 2014 circular, diluted the 2013 circular to help these cronies. The letter says that after the initial 20:80 (2013) scheme was introduced, the few big traders lost some of their lucrative business and had started lobbying. The then Congress government gave in to their lobbying before demitting office in May 2014. “Having achieved the targeted CAD level, the outgoing government did not care for future sustenance of the CAD and deliberately yielded to the cronies by effecting last minute changes in the Gold Policy, just before demitting office by causing publication of RBI circular dated 21-5-2014″. The letter accuses the Congress government of diluting the scheme to an extent of practically scraping it. They went on the provide a comparative analysis of the 2013 scheme and the diluted 2014 scheme by P Chidambaram because of which the gold imports in June 2014 suddenly skyrocketed. The comparative analysis makes it extremely clear that the order signed by P Chidambaram diluted the 2013 circular to hugely benefit private players. 2013 circular applied to Nominated Agencies that comprised of Government undertakings but did not include private players. Circular effected by Congress facilitates only private players who are Star Trading House or Premier Trading House status holders. 2013 circular stipulated that out of Nominated Agencies, only those entities who in the past were engaged in availing gold to exporters are eligible to operate under 20:80 scheme. Circular effected by Congress stipulated that even private players who had a record for importing only for domestic market were eligible to import gold regardless of whether they had ever catered to the exporters. 2013 circular stated that even the entities falling under this circular, who had never catered to the exporters, cannot import Gold. The Congress circular negated this and lifted this restriction for Star Trading Houses and Premier Trading Houses. The catch, however, was that in the 2014 circular, the 2013 restrictions were still applicable to government agencies but not private players. 2013 circular required entities operating under 20:80 scheme to cater to needs of general exporters who are engaged in genuine jewellery exports. The Congress effected circular in 2014 negated this entire restriction. After 2014 circular, they did not care to reach out to general exporters. Instead, to meet the target of 20% exports of the imported lot, they either themselves or through such concerns on whom they have effective control engaged in fictitious exports by making crude bangles or similar things overnight and importing the next lot immediately. 2013 circular ensured that the entities operating under 20:80 scheme were availing gold to a wide number of jewellers in the domestic market. They were also advancing gold loans of jewellers for manufacturing. After the Congress circular of 2014, they didn’t care for the jewellery industry. Refused to provide gold loans for manufacturing and would offload the import consignment to a few big bullion dealers. 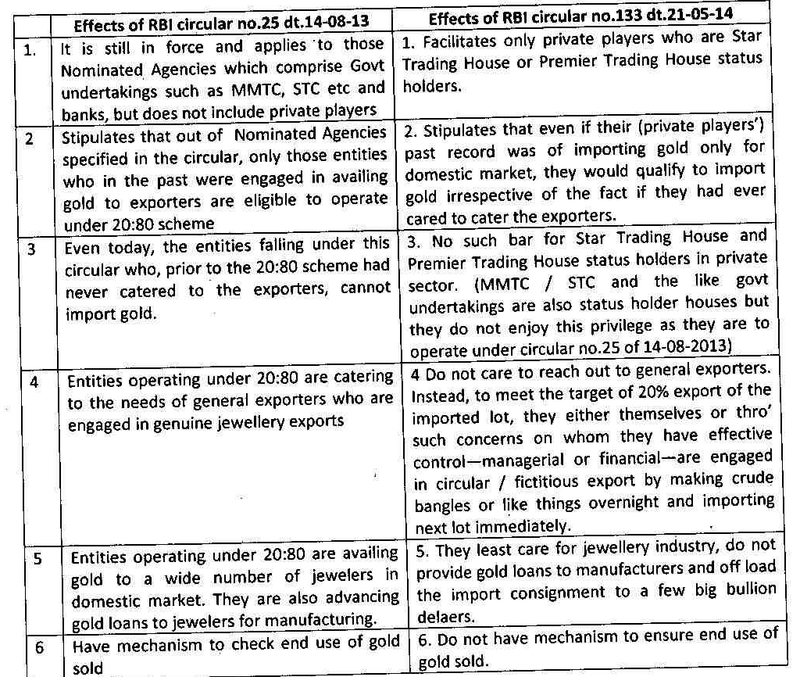 2013 scheme had mechanisms to check end use of gold sold. The Congress circular of 2014 had no such mechanism. “India is an exporter of handcrafted gold jewellery, which is a high labour intensive industry. It takes anything between 15 to 90 days to process the jewellery before export. But those with a different motive would procure gold, convert it into crude pendants or bangles or chains with the help of machines any quantity overnight and export into to Dubai the next day. In Dubai, it directly goes to a refinery for converting into gold bars and sold within 24 hours. The loss incurred in this operation is more than compensated by the trading in domestic gold”. It said that the 2014 circular had clearly “sidestepped nationalised banks, which have been the backbone support of our bullion importing and jewellery exporting members by allowing certain private sector export houses to import gold up to two tonnes at one time, even for those who are not in the business of bullion and gold jewellery”. The letter asked Raghuram Rajan to make a “prudent appraisal” of the scheme affected by the Congress Government and take measures to plug the loopholes before it is too late. “Stung by the surge in imports that peaked in November at 151.6 tonnes, on November 28, 2014, finance minister Arun Jaitley piloted a move to scrap the so-called “80:20” rule mandating traders to that a fifth of all the precious metal imported should be re-exported”. Moneycontrol.com has also put out a letter written by the IBJA to the then Finance Minister P Chidambaram on 10th December 2013 detailing the issues they were facing. “In India, the Bank’s exposure on Gold Industry is considered at approximately Rupees 3 Lac Crores and if Banks do not supply sufficient quantity of gold to its account holders, it is likely that all this account turn into bad account leading to a bigger crises not only for the gold industry but also for the Banking sector”. Yet, Chidambaram sanctioned the scheme on 16th May 2014 – the day Lok Sabha results were known and it was clear that Congress was booted out of power – and the then RBI governor Raghuram Rajan cleared the file a few days later on 21st May 2014 – five days before Narendra Modi took the oath as the new Prime Minister.